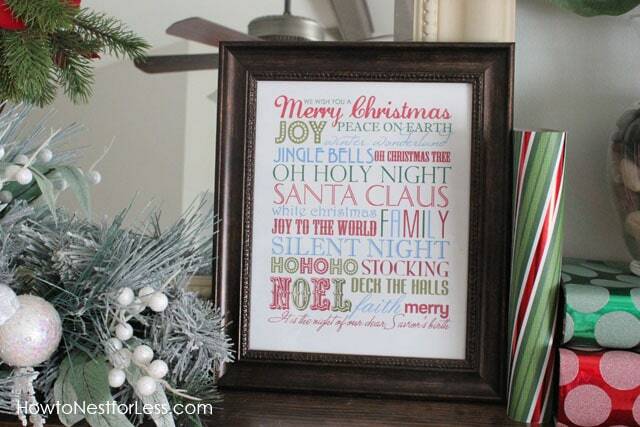 Thanksgiving has come and gone and now it’s time to get in the holiday spirit! I dug out my Christmas decorations from the basement and noticed that I had a theme going in a lot of my décor… poinsettias. So this year instead of breaking the bank and buying new stuff, I just decided to make a Poinsettia Themed Christmas Fireplace Mantel. Come take a closer look! I recycled a lot of the same elements I used in my Fall Fireplace Mantel… hey, this girl is trying to nest for less. 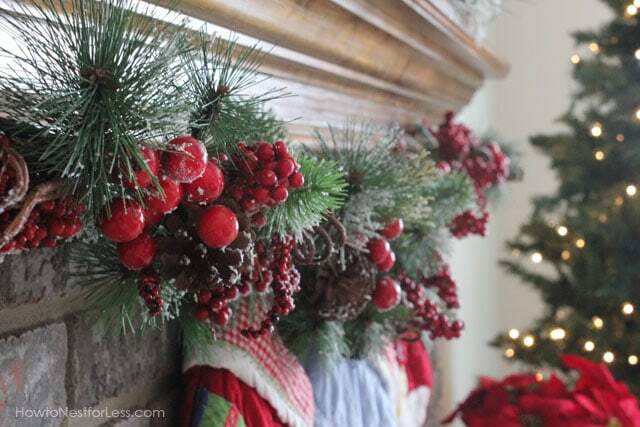 One of the main components of my mantel is the red berry garland strung across and I held it in place using Command™ Brand clear hooks… love those things! I also used one of the hooks to hang the wreath in the center of my mirror. And of course I had to display my latest Subway Art printable. Download it for free here. One thing that I did purchase were these little burlap red poinsettias from Kirkland’s. I just couldn’t pass them up! 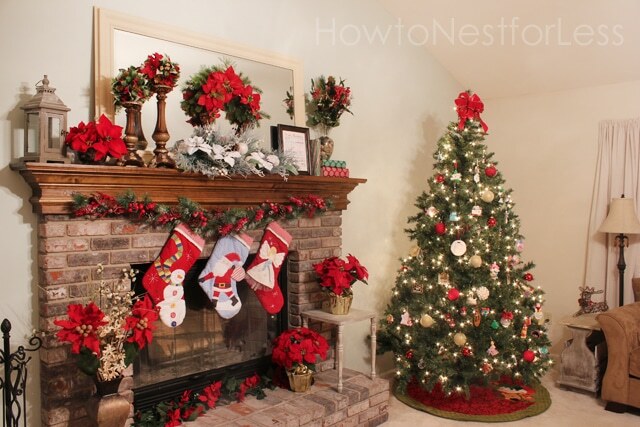 Here’s a couple night time shots of my Poinsettia Christmas Fireplace Mantel. I just couldn’t help but to share a couple more photos… enjoy! I’m really not a fan of red (if you can remember, I’m trying to phase it out of my house right now), but since we’re hoping to sell the house in the Spring, I guess I can wait a year until I buy new decorations. Hmm… might have to hit the clearance aisles in January! SO, DO YOU HAVE YOUR HOLIDAY DECORATIONS UP ALREADY? 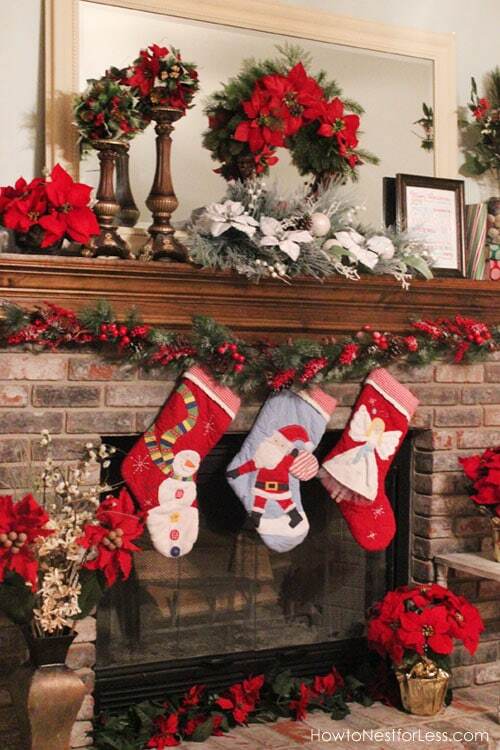 Your mantle is very inviting! Love the pops of red! Hopefully I will get mine done this week! Thanks so much, and good luck with yours! It looks great Erin! We just got back from MN late last night…wanna come do my mantle for me? Pretty Please?!? HAHA!! You supply the wine and decorations and I’ll help! Ha! Thanks so much Lisa! I was having a hard time getting motivated to get the Christmas stuff up. Maybe because Thanksgiving was so early this year! Good luck to you! This is gorgeous! I love poinsettias 🙂 I have not done any decorating yet. Pulled my tree out of the attic and that is as far as I have gotten. 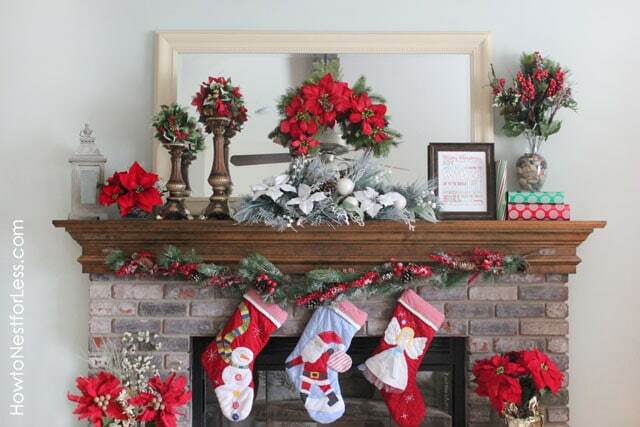 Thanks for sharing your beautiful mantel! Looks beautiful! 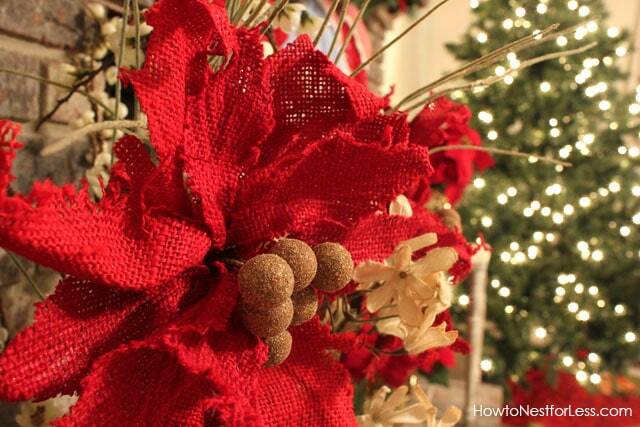 Love those burlap poinsettias. great buy! Haha! Kirkland’s also has cream colored ones. So cute!